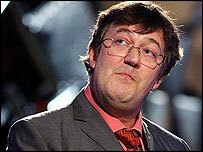 Comedian Stephen Fry is in talks with the BBC about the possibility of writing an episode of Doctor Who. The acclaimed author, director and actor may contribute to the series, which returns later this year with David Tennant as the next Time Lord. A BBC spokeswoman said: "We are in talks with Stephen about the possibility of him writing an episode of Doctor Who." There were no plans for Fry to appear in the series, the spokeswoman added. Fry was among the actors touted as a possible Time Lord when plans to revive the series were announced in 2003. In a poll carried out by BBC Worldwide, MPs chose him as the person they most wanted to become the Doctor. Asked by Radio Times magazine about the possibility of him playing the lead character in 2003, Fry said: "All I can say is I've done a couple of dramatised Doctor Whos for radio and internet and it may be that more things emerge in the future." If he does write an episode, he will be the latest comic to do so. League of Gentlemen actor and comedian Mark Gatiss wrote an episode of the recent series, set in Victorian times and featuring an appearance by novelist Charles Dickens. The BBC recently announced there would be a third series in the current run of the drama, written by Russell T Davies.